Rabbi says victims came to Mumbai "to spread goodness and kindness"
MUMBAI, India (CNN) -- Hundreds gathered in the Indian city of Mumbai on Thursday to commemorate the Jewish holiday of Hanukkah and honor the memories of the rabbi, his wife and others who were killed in terror attacks last month on a Jewish center and other locations. 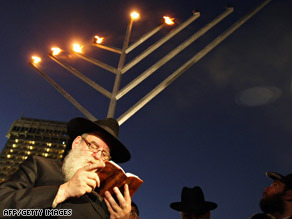 Rabbi Moshe Kotlarsky recites a prayer in observance of Hanukkah on Thursday in Mumbai, India. People stood at the Gateway to India monument for the lighting of a menorah, the nine-branch candelabra. A similar ceremony had been held an hour earlier at the Jewish center, called the Chabad House. The rabbi, Gavriel Holtzberg, and his wife, Rivka, were among six people killed when attackers assaulted the Chabad House, one of several targets hit in the coordinated terrorist strike. Holtzberg, who was affiliated with the Orthodox Chabad-Lubavitch movement, in past years was the one to light the Hanukkah candles at those same places. The Chabad Web site said Rabbi Shimon Rosenberg, Rivka's father, lit the menorah at the Gateway to India, a stone arch near the Taj Mahal Hotel that was the entry point for the people who launched the attack. "We will continue," Rosenberg said. "A little bit of light dispels a lot of darkness." Nachman Holtzberg, the father of Gavriel, lit the menorah at the Chabad House ceremony, the Chabad Web site said. Both lightings came just before sundown Thursday, ushering in the fifth night of the eight-day holiday. Indian authorities believe that the 10 men who carried out last month's attack on Mumbai, killing 160 people, were trained at a terrorist camp in the Pakistani-controlled part of Kashmir. Speaking at the Chabad House ceremony, Rabbi Moshe Kotlarsky, a friend of the Holtzbergs and vice chairman of the educational arm of Chabad-Lubavitch, said the group's officials and rabbinical students led by the directors of the Chabad House in the Indian town of Goa have worked to continue the group's activities in Mumbai. "We never left Mumbai," he said, as quoted in an article on the Chabad Web site. "We are here, and just as Gabi and Rivky would have wanted, we will remain and continue to build here." Kotlarsky said the Holtzbergs came to Mumbai "to spread goodness and kindness, to be a beacon of light to this city." They operated a synagogue and taught Torah classes. The rabbi also conducted weddings for local Jewish couples. "Hanukkah is the festival of light," Kotlarsky said. "It celebrates the victory of the few over the many, the weak over the strong. And today, we celebrate the victory of right over wrong." The word Chabad is a Hebrew acronym for chachmah (wisdom), binah (comprehension), and da'at (knowledge), according to the group's Web site. The Chabad-Lubavitch movement was formed more than two centuries ago in Russia. The organization says 4,000 full-time emissary families now direct more than 3,300 Chabad institutions around the world.